My C2E2 weekend was an absolute blast, and I look forward to regaling you with stories as I bring you titles that I picked up at the show. 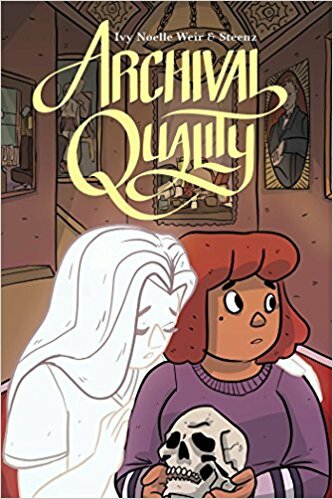 And today, I’m pleased to bring you a cool Oni Press book that just hit shelves last month! This 265-page story is part horror, part mystery, and part literary fiction. While reading this, I could not help but to feel shadows of films like The Ring where the protagonists are working to free a spirit that is seeking freedom from the shackles of a dimension of torment in order to find peace. And, yes, I know ultimately, The Ring does have a unique twist that might nullify that point, but a part of Archival Quality does, in fact, hold moments of those horror tales of heroes looking to liberate something that has been trapped. A good part of our protagonist’s story comes in the shape of attempting to help a tortured soul living in the medical library/museum that she has found employment and living quarters. But while the quest to help a young girl find peace in the after-life is a driving force here, this book is about much more than that. Celeste, our protagonist, has a history of mental health issues, and she must battle her illness in order to find her own happiness in the process. The book is slowly paced and not filled with the action that we expect from a horror/suspense title. We find ourselves focused on the interactions between characters over our struggle as a reader to discover the mysteries of the story. We spend most of our time with Celeste and her friends/co-workers as they navigate their conversations, developing relationships that are important as the story progresses. And when we get to the climax, the development of the characters’ relationships becomes even more important in the book’s resolution than the falling action itself. I dig this book. It reads in a pace that is unique, and it develops characters in a way that we normally do not see in a genre like this. And adding mental health issues to the themes in the graphic novel adds yet another layer of interest and complexity. Steenz’s simple, yet effective, solid-color art, in large panels, helps break up the conversations. If this book were crammed into 200 pages, we might feel a bit cramped or claustrophobic in the read; however, we do not. It is beautifully constructed, and in the read, we can see why the writer and artist have become as close as they describe in the back matter.